It’s here, the home stretch, we’re entering the biggest most lucrative shopping season for retailers, and a paradise for bargain hunters. Regardless of how much you shop or how much you enjoy it, like everyone else, most will begin the New Year with a large credit card bill and unwanted products. 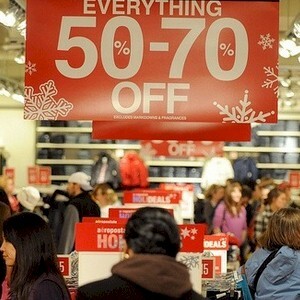 There’s just too many price promotions, bargains, and we all get swallowed up in the joy of the buying frenzy. So whether it’s the wrong product, the wrong gift, we all just become consumed and begin spending money at will. The best solution it’s found is to resign yourself. Starting now, approach the holiday shopping spree knowing that you don’t need to get the best products at the lowest prices, or realize that you could of bought a better gift. Save yourself the time and energy, and preserve that for spirited socializing instead. But most are perfectionists, needing to purchase that precise gift for that special someone at a sale price, and become obsessed. The key is to not make the most common bargain purchasing blunders. The majority of shoppers won’t buy something unless it’s on sale, and the retailers pounce of this instinct. To create the illusion, what they’ll do is inflate the “regular” price beforehand, and then place a big red label on them that they’re discounted. These promotional sales are also now completely ubiquitous, as they appear everywhere, constantly on our tablets, smartphones, and TV screens, the attacks being relentless, placing you in the mood to buy now. The biggest scare tactic remains scarcity, that you’re going to miss out on the sales, the bargains, and it’s critical that you buy now or you’ll lose. Sales which are caused by “the fear of missing out,” can reach fever epidemic proportions, causing the sensation that you’ll get a lot more for much less. What all the fear and the excitement does is it muddles the thinking. Then mix in the competitive fuel, the frenzy along with the emotional pressure of the big crowds, and then it becomes understandable on how most will make regrettable purchasing decisions this time of year. Most of the early sales are usually “promotional” and the retailers have planned well in advance before the holidays, this to lure in the early shoppers while generating excitement. As a result, until a week before Christmas, you’re unlikely to see any deep clearance prices. For Black Friday, discounts are usually between 20-55% percent off for just the lost leaders and door buster deals. Realize that these Black Friday discounts are planned beforehand, as the retailers prepares to dump off or offer inferior versions of elite products, this to lure in the Black Friday shoppers. The shoppers really aren’t missing out that much on these sales on Black Friday, other than the “door buster” deals. These are the products that the retailers are panicking about, items that they need to dump off as they’re old inventory, usually at cost. In the face of all these spectacular jaw-dropping bargains, remain focused on how much you really need that item, even if it’s at a discount. During the frenzied moments, it becomes easy to lose focus. What then happens is that you begin purchasing gifts on sale and then begin searching for a recipient, this rather than choosing the perfect gift for someone on your list. Once we enter a retail outlet, we all become emotionally charged, which makes us prone to making impulse purchases. This also happens online, where there are a number of tempting add-on items, stocking stuffers, which just increases our holiday spending budget. The solution is to have a plan beforehand, breathe deeply and take a moment to consider what you’re buying at what price and for whom. Realize that once you have money in your hands and are determined to buy something, you become extremely vulnerable. There’s research which supports that consumers who are bargain shoppers actually end up spending more money than those who don’t bargain shop. The reason being they spend more of their time shopping, which exposes them to see and buy more merchandise on sale. These bargain shoppers will also focus on how much they’re saving, while losing track of what they’re spending. What they do is consider the money that they’ve saved as money that they’ve “earned,” which means that it makes spending that money much easier. There are pitfalls to all these bargains as there’s often strings attached to them. The most common being that most discount items come with a “no-return” policy, or they just qualify for an in-store merchandise credit. So for those who shop impulsively, unless you’ve considered the merchandise beforehand and really need it, not being able to return the goods become costly, as it will just sit at the bottom of your closet. What happens is that most will spent their Christmas budget on clearance or bargain bin merchandise, and although a few items are useful and a steal, most are useless. You’re stuck with them, and you won’t dare giving them as gifts, so they’re not really a bargain after all. So beware as you trek out to the big bad department store and search for these bargains. Keep in mind that the best antidote is to remain calm. Just focus on the value, the cost of a product, this rather than if it’s on sale.